A group of members of the Forgotten People gather in a house at Black Falls, Ariz., near the uranium-contaminated Box Springs well. Photo by Rachel Wise. On the side of Gray Mountain in Northeast Arizona, Lorraine Curley lives alone in a two-room concrete home. Her roof is tarpaper and tin, and her bathroom is a wooden outhouse 50 feet from her door. Living without electricity or water is a way of life for Curley; she has, after all, been restricted by the Bennett Freeze, a law enacted in 1966 and not lifted until last May. Because of that law, more than 18,000 Americans were restricted from making any repairs to their homes or from building new ones for 43 years. Curley would like a new home, but she’s not picky: It doesn’t need to have electricity or running water – a floor and insulation would be nice. “Maybe I’ll never see a home,” she said. And at 79 years old, Curley is running out of time. Curley is Diné, or Navajo, and like more than 180,000 others in her tribe, she lives on the reservation known as Navajo Nation, which spans a sprawling 27,000 miles stretched across Arizona, New Mexico and Utah. The land is also rich in highly sought-after natural resources, like coal and uranium, which has proven to be both a blessing and a curse. With its vast and breathtaking sandstone vistas and scrubby desert floor, the territory includes some of the prettiest land in America, but its people, scattered throughout, are without a doubt some of the country’s most desperately underserved. Because of its sovereign status, Indian territory is not regulated by federal environmental standards. In addition to oil and natural-gas drilling, the Nation was subjected to uranium mining from 1944 through 1986, when almost 4 tons of uranium ore was extracted for use in the arsenal build-up of the Cold War. It was mined without regard to the safety of the miners, the nearby residents or even the mineral-rich land itself, resulting in the inevitable pollution of the air and water. 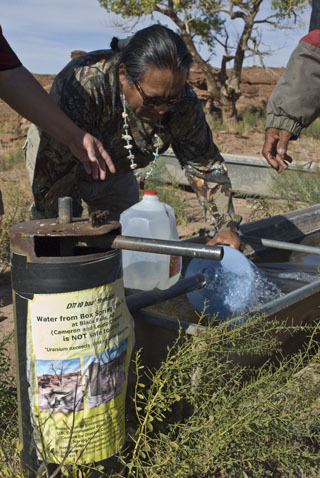 As a consequence, the land they treasure so deeply has turned against the Navajo people, many of whom have developed severe health problems from drinking contaminated water and breathing contaminated air. And then there’s the coal. Since the mid-20th century, coal has been the primary source of energy for electricity-generating power plants around the world. Regardless of how it is measured, coal mining, and the processing of converting coal into electricity, has proved to have a devastating environmental impact. Coal mining pollutes land and seeps into groundwater, while emissions from burning coal have been cited as one of the main sources of global warming. Currently, there are five coal mines on Navajo land, and two companies are fighting to open up two more — Black Mesa (which was closed in 2005) and Desert Rock. Sithe Global, the multinational corporation looking to open Desert Rock, says the Navajo stand to make $52 million a year from the power plant in addition to the income from new jobs. But in reality, with more than 90,000 unemployed and thousands more underemployed, the Desert Rock plant will barely make a dent, employing only 300 workers. And although it is promoted as “clean coal,” a report by the Sierra Club estimates the emissions will poison the air, soil and water forever with toxic chemicals including carbon dioxide, sulfur dioxide, nitrogen oxides and solid waste containing cadmium, selenium, arsenic and lead. Coal mining on the reservation is a thorny and multilayered issue. While coal companies, such as Sithe Global and Peabody Coal, are eager to build or reopen coal-fired power plants, both non-native and native environmental groups like San Juan Alliance and Diné CARE (Concerned Citizens Against Ruining Our Environment) warn of the disastrous impact of the projects. The president of the Navajo Nation government, Joe Shirley Jr., has sided with the coal companies, but the Navajo people themselves remain divided while bombarded with conflicting opinions. There are roughly 40,000 occupied homes on the reservation. With rare exception, the Navajo homes are not served by the reservation’s power plants, leaving 18,000 homes without electricity. These homes are heated with wood stoves. 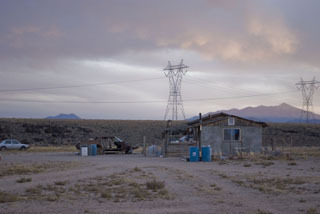 The Nation is cut through with massive power transmission lines, which bypass but pass next to crumbling hogans (a traditional adobe Navajo dwelling), dilapidated trailers and one-room shacks. Those power lines run energy to cities in the Southwest, some of southern California and all of Las Vegas. With its wealth of natural resources, it would be easy to imagine the people of Navajo Nation are wealthy beyond their wildest dreams. But the tragic irony is that many are excruciatingly poor, having derived no profit, in personal terms, from any of the bounty of their land. There is a common misconception that the Navajo actually own the land on which they live, but in fact they don’t, which means they have no control, ultimately, over how it is managed, even though they have lived on the land for hundreds of generations. Rather, it is held in trust by the U.S. government (or “in reserve,” thus the term “reservation”). To complicate matters, there are dozens of laws on the books, which further complicate the rights and responsibilities of the federal government, the Navajo government and the people themselves. For example, an 1872 Mining Law opened the land to mining with no oversight, even permitting mining on private land. In addition, oil and gas leases were made possible by the Indian Reorganization Act of 1934, when industry, in partnership with Washington, created the opening of lands to thousands to make mining claims without compensation to the indigenous people. That arrangement has kept the Navajo people in a form of patriarchal colonialism since 1868 when the first treaty was signed. Unable to manage the land themselves they were at the mercy of the U.S. government and its agreements with industry. “I strongly believe it’s time, it’s due — people deserve compensation,” said Carol Colorado during a recent meeting of the Forgotten People, a community development corporation concentrated in the Western part of the reservation. Colorado and about 30 cohorts met at a home in Black Falls, near Box Spring, a well of clear, cold water — rendered toxic from years of mining. Activists say there are more than 1,200 abandoned mines in the Nation (although the Abandoned Land Mine Office consolidates that number closer to 500). The uranium-mining companies are long gone, but the contamination remains. Robyn says, to her knowledge, no corporate entity has ever been prosecuted for uranium contamination on Navajo soil, and yet as far back as the 1930s there was an awareness of the health risks associated with uranium. Somehow the message never made it to the Navajo. As recently as the 1980s — half a century later — U.S.E.P.A. scientists were putting Geiger counters to the wall of hogans near abandoned mines to measure radiation and seeing readings that were off the charts. Florabell Paddock, 76, attended the Forgotten People meeting with her companion of 40 years, Jerry Huskon, 68. Like the thousands of others in the Western Navajo Nation, Paddock, a tiny, frail woman, has never had running water, instead having to haul heavy jugs from a nearby well to her home — something she won’t physically be able to do for much longer. And like so many others, her ailments are multiple. “I drank water from the Tochachi Spring,” she said in her native Navajo, interpreted by the president of the Forgotten People, Don Yellowman. “My doctor told me my gall bladder was not working and I had internal bleeding. I have asthma, seizures, a problem with lung and liver,” she added, alluding to the cancer that has spread throughout her body. Pauline Lefthand, 41, also came to the meeting, albeit slowly and with help from a daughter on one arm and her husband on the other. She sat heavily in a metal chair and often nodded off during the meeting. She takes 15 pills a day, including strong painkillers. “We did. We drank a lot of water from the well. That’s what we lived on. It’s one of the best waters,” she said, referring to the cool, refreshing taste of the water, which nonetheless was poisoned by the tasteless, odorless radionuclides. The medicine she is prescribed also has taken its toll. “When I started, I weighed 135 pounds, then I went up to 247 pounds. Now I weigh 192,” she said. Lefthand’s daughter Deidre Walker, 18, was there to support her mother, whom she said has had “kidney failure, diabetes, seizures” since Walker was eight years old. Two years ago, Walker gave her mother one of her own kidneys. Despite decades of contamination, the U.S.E.P.A. began posting warning signs on drinking wells and in local post offices three years ago. Other education has been more grassroots, such as the recent community meeting. Local and national environmental groups are actively reaching out to educate Navajos about the drinking water and to build a consensus against new coal mining and power plants. Those environmental groups came under fire last week by the tribal council of Hopi Nation (which is surrounded by the Navajo Nation) who voted 12-0 to ban outside environmentalist including the Sierra Club, Natural Resources Defense Council, National Park Conservation Association and the Grand Canyon Trust groups from Hopi territory altogether. Local Navajo environmental groups say they don’t appreciate the censorship. 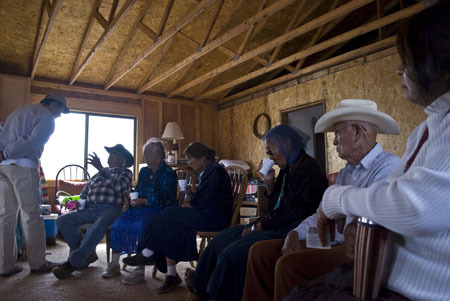 The struggle between environmentalists and corporations runs deep within the reservation. While environmentalists strive to educate residents about the risks of uranium exposure and strive to end coal mining, the corporations looking to mine the land fight back. The Navajo Nation is divided into councils which voted 71-8 in February to approve the right-of-way legislation for Desert Rock. But last month the U.S.E.P.A. issued a remand against the mine until more air emission studies can be completed. Along with the environmental and health challenges faced by the Navajo Nation, there has existed for many years a stigmatizing law further crippling development. Named for U.S. Commissioner of Indian Affairs Robert Bennett, the Bennett Freeze, enacted in 1966, restricted construction on more than 10 million acres of Hopi-Navajo disputed land. By law, no construction, additions or repairs could be made to any homes in the area, which covered 19 chapters — local governments — of the 110 chapters that make up Navajo land. The law was originally intended as a temporary measure to prevent either tribe from claiming land that wasn’t theirs until the division of the land was resolved. But the ban lasted 43 years, leaving thousands of Navajo without the means to make much-needed home repairs or to build new housing as needed, essentially crippling the people trapped within the Bennett Freeze. The Freeze was lifted by President Obama on May 8, 43 years later. But, most houses are now beyond repair. The long-standing restriction has taken a huge financial toll. The Navajo territory, at 27,000 square miles, has only 2,000 miles of paved road and many more thousands of miles of unpaved, dirt roads, much of which are only accessible by foot or on horseback. That lack of infrastructure, along with tens of thousands of homes that remain “off the grid” without running water and electricity, has essentially locked those within the parameters of the reservation into poverty, and over the years, a collective and growing despair. With more than half of the Diné people living below the poverty line, and just as many unemployed, mental-health specialist Lusita Johnson sees a lot of depression. Still, Lorraine Curley, the elderly woman on Gray Mountain, holds on to hope for a new home. She spoke to reporters outside her house recently as dusk settled and several coyotes meandered past. A hundred yards to the south, massive power lines sizzled across the million-dollar desert view. She had been to check on her housing application, she said, and the news was not good. She was told her application needed to be resubmitted. Next, she has to commission an archeological survey. And last, there is a two-year wait for a new house — but that doesn’t mean they’ll be money to build, even then. “We’re just being led on, nothing ever happens. They just keep asking for documents,” she said, as the sun set behind the gray mountain. Since the treaty of 1868, we have allowed the U.S. government through the Dept. of War, now Department of Interior, and the Bureau of Indian Affairs (BIA) and through Federal Indian Laws written to benefit the U.S. Government, and not the Indian Reservations, the U.S. Government has failed in it’s mission to hold us in “trust”. The covert manipulation through peliminary powers has allowed the U.S. to misuse millions of lease agreements and monies to the detriment of the Indian Reservations. Simply put–this system does not work to benefit Indian Country. We need to abolish and abolish old treaties and amend them to fit our needs, our profitability, our self-sufficency. We’re the ones dying as a result of government envolvment that hold our reservation in “reserve” for their economic gain. We need to abolish the BIA, restructure the Dept. of Interior to admit Indian leaders to sit on the board of commissioners and hire our own lawyers to address the disadvantagous laws that restrict us from protecting our families and our economy! We then need to take our fight to the United Nations! All Indian Nations must unite to fight this common cancer and form a third branch in the Congress: Senate, House of Rep. and Council of Indian Rep.
Another roadblock to our Nation’s progress has been the obsurdity of the terms of the original mineral lease agreements that have been entered into by our so-called Secretary of Interior’s “trust” responsibility to ensure that the Navajo Nation would benefit the most out of these lease, but have sold the Nation out for future positions on the Board of Directors in California, specifically Senator Udall negiotating terms for the Navajo Generating Plant in Page, AZ, that stipulates a 75 year lease with an automatic lease extension of 50 years and then an 25 year optional extension, when negiotating the Seven state Water Project that benefited the state of Arizona, Neveda, and California. This is an example of how the U.S. unfairly negotiated our water rights away, as well as our ownership of the Generating Stations on the Navajo Reservation. If one were to closely look at the closed-door deals that transpired in regard to our leases on the reservation, one can easily witness the one-side benefit, a benefit to the U.S. and corporations that gained huge profits–all we were offered at the time were jobs and a fist full of dollars called royalties! The U.S., through the scrupulous negotiations of the Dept. of Interior sold us down the Colorado River and made millions for everyone else but the Navajo Nation–now that we understand the concept of economics and terms of contracts, our ignorance of business negottiations was taken advantage of. We should have lawyers addressing this major issue and re-negotiate lease from the 50’s and 60’s and file suit for just compensation in the billions lost over the “time-value” of monies and interests! This is just another atrocity served up by the government againt the original inhabitants of our nation. When are we ever going to set greed aside for the welfare of every Anerican? Thank you Rachel for separating fact from fiction and the insightful reporting on this subject matter. Great Post. Can you email me back, please. Thanks so much. Great Post. Can you email me back, please. Awaiting your Answer. Awesome! Great post, keep it up! Hi – I would like to say thank you for an interesting site about a subject I have had an interest in for a long time now. I have been looking in and reading the comments avidly so just wanted to express my thanks for providing me with some very good reading material. I look forward to more, and taking a more proactive part in the discussions here, whilst learning too!! Great post. I’ve been looking for this exact information for a while now. I’ll bookmark it in the public bookmarking sites to get you more views. I must say that generally I’m really impressed with this blog. After reading your post I can tell you are well-informed and knowledgeable about your writing. Keep up the great work and I’ll return for more! Cheers! Amazing, that is really nice info, cheers. Thanks for the great post! You have a new fan.